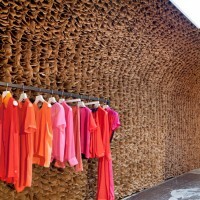 Tacklebox Architecture designed the interior of the OWEN store in New York. 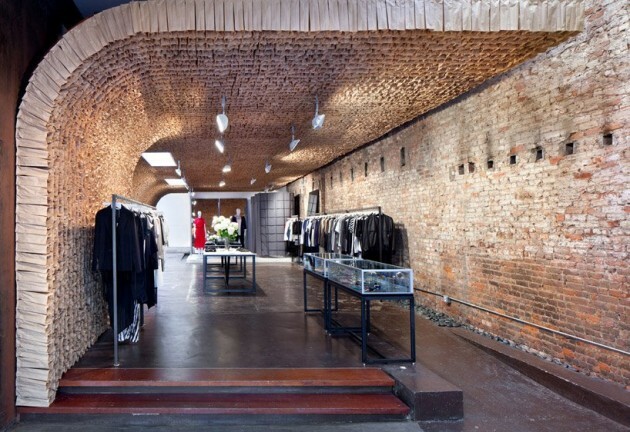 Located in the Meatpacking District, OWEN occupies an 1,800 square foot space that previously housed a meat storage facility, auto storage, and a floral shop. In response to the rich history of the space and through the juxtaposition of industrial elements with the handmade, we sought to create a place that is both familiar and timeless. 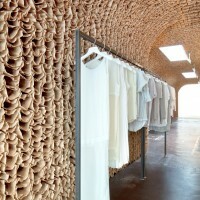 Here a continuous surface, hand-built out of 25,000 brown paper bags, arches from floor to ceiling. 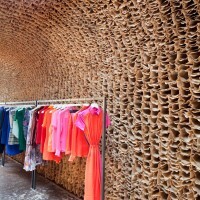 The repetition of the paper bags results in a honeycomb-like structure that defines a warm, organic volume which sits within the existing industrial brick and concrete space. Additionally, all clothing, accessories, and jewelry are displayed on quartz slab tables, blackened steel hang-bars and steel and glass vitrines whose linearity and crisp details sit in contrast to the delicate texture of the paper arch beyond. Visit the Tacklebox Architecture website – here.